When you are looking for a place to dine and have a good time, then enjoy food, drinks, and fun at The Office Bar & Grille. With a welcoming atmosphere and friendly staff, you are sure to come back time and time again. Entertainment here includes Buzztime interactive trivia, kid’s trivia, and live music every Saturday night. If you are stopping in for a drink with friends, they have twenty beers on tap, including: Conshohocken IPA, Boulevard Tank, 7 Farmhouse Ale, Deschutes Fresh Squeezed IPA, and Neshaminy Creek Churchville Lager. For food, their entire menu is available for dine-in or take-out. Start off with appetizers like their Boneless Chicken Tenders, Beer Battered Onion Rings, Yellow Corn Tortilla Nachos, Signature Housemade Spring Rolls, Crab & Mushroom Rangoons, and more! If you are looking for a healthier option, they have many different salads to pick from that can be customized to your liking. Main course favorites at The Office Bar & Grille include their Maryland Crab Cake Sandwich, Philadelphia Cheese Steak, Veggie Wrap, Black & Bleu Burger, and Veggie Burger. You can also make your own custom burger or chicken sandwich by selecting from 18 different toppings. Looking to really treat yourself? Try their Angus Flat Iron Steak, Jumbo Lump Crab Cakes, or the delectable Shrimp and Crab Mac & Cheese. 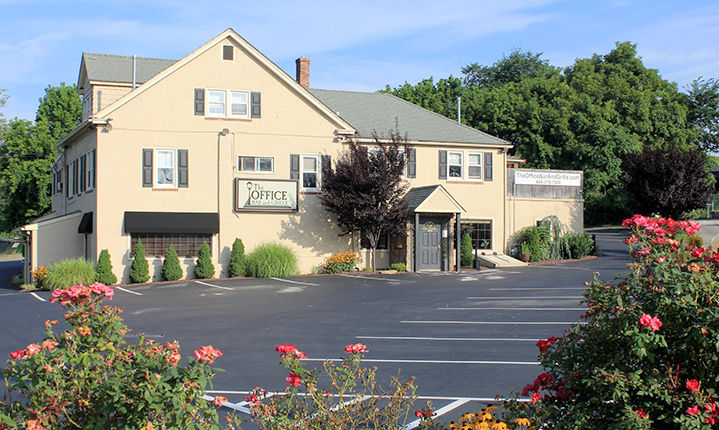 The Office Bar and Grille is located at 1021 Morehall Road in Malvern, PA. Click here to visit their official website, or call them directly at (484) 318-7806.